RED DOG MINE: Zinc profits could bring a $200 million annual distribution in future. Alaska Natives may soon receive a new cash infusion due to a bluish-white metal found in the Northwest Arctic. The big boost in Alaska Natives’ share of profits expected from the world’s largest zinc mine could pump $200 million to Native companies around the state in the coming year, and possibly for years to come. The source of this largesse is the 18-year-old Red Dog Mine, carved out of Native land in the Brooks Range foothills, about 59 miles inland from the Chukchi Sea. Red Dog’s zinc is used to galvanize steel and its biggest customer is the auto industry. The story of zinc at Red Dog could play out much like today’s high oil prices, which are goosing state revenue from the North Slope oil fields. After opening in 1989, the open-pit mine struggled due to many years of low zinc prices. But prices rose a couple of years ago and this fall, Teck Cominco, the Canadian company that runs the mine, finally recouped the cost of building it. That is triggering the increase in royalties paid to Natives. The recent high zinc prices are helping too. Teck pays the royalties to Kotzebue-based NANA Regional Corp., which owns the land. By federal law, NANA keeps 38 percent of the royalties and shares the rest with Alaska’s other Native corporations. This sharing is a unique provision of the Alaska Native Claims Settlement Act of 1971, the federal law that created Native corporations and required them to share their timber, mineral and oil and gas profits. The ultimate goal: spreading the wealth between corporations that have valuable resources on their land, and ones that don’t. Due to a rise in zinc prices, the value of Red Dog’s production — which also includes lead and silver — topped $2 billion last year, more than all the state’s other mines combined, according to state figures. Though some in Kivalina, a nearby village, remain concerned about environmental contamination from the mine, Red Dog has been one of NANA’s biggest business ventures. According to NANA executives, Red Dog’s value is not so much its profits as its jobs for NANA shareholders. The mine is the largest private employer by far in the Northwest Arctic borough, where there are few other jobs outside government and nonprofits. “The reason for (building) Red Dog was jobs,” said Helvi Sandvik, president of NANA Development Corp., the business arm of NANA Regional. Royalties are less important to NANA, she said. Company executives hope the mine will continue to operate for decades, but it will need to expand to new ore deposits to do so. The mine will run out of ore at its current operation in 2012. As long as zinc prices remain high, and the mine keeps running, bigger royalties from Red Dog will be felt around Alaska. The reason is an agreement signed by NANA and Teck before the mine opened, stating that when Teck pays off its development costs for the mine, it will begin paying a heftier royalty to NANA. The increased royalty begins at 25 percent, and every five years it increases by five percentage points until it hits 50 percent. Until this fall, NANA’s royalty was set at 4.5 percent. NANA has waited a long time for this change. The company originally expected the shift to a larger royalty a decade ago, but the price of zinc plummeted, and stayed low, NANA officials said. Teck officials say they are satisfied that the agreement is moving to the next stage. “It strengthens the partnership (with NANA),” said Jim Kulas, the mine’s environmental superintendent. The cash infusions will begin early next year, when NANA will receive its first 25 percent royalty on Teck’s net proceeds from Red Dog. The payment is expected in January. The other regional corporations will get their share a little less than a year later, after NANA completes its fiscal year. That’s not the end of the sharing, though. In turn, the other regional corporations in Alaska must pass along half of what they receive to village corporations and “at-large” shareholders who don’t own stock in a village corporation. It’s up to the regionals and the village companies to decide how to divvy up the rest. Many choose to pass the money along to their shareholders as dividends, but other companies put the money to other uses. It’s only since about 2005 that Red Dog has turned a substantial profit. “As soon as the mine opened, the price of zinc fell to historic lows,” Sandvik said. 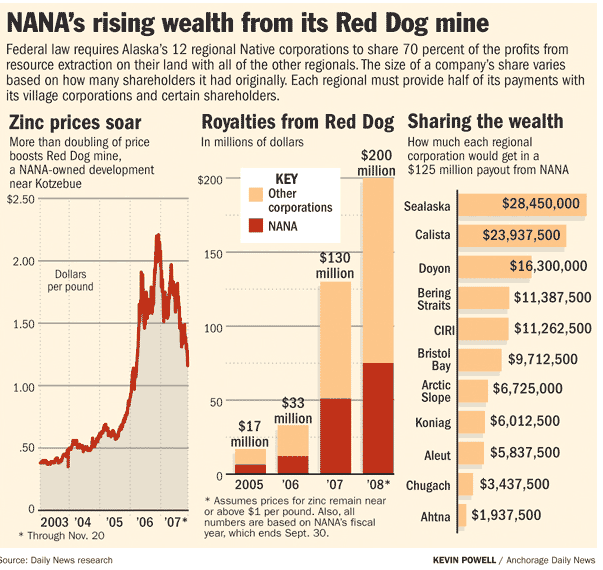 In 2005, however, NANA’s share of Red Dog profits hit $6.5 million and nearly doubled in 2006. NANA’s income from Red Dog is expected to quadruple this fiscal year — rising to $51 million. In the future, if zinc prices stay at around $1 per pound — a little lower than where it stands today — the Native corporations including NANA will share $200 million each year. NANA will keep $75 million and share the rest. The executives at NANA aren’t miffed that they will get a smaller share of Red Dog profits than their colleagues at other Native companies. NANA, in turn, receives income from natural resource projects on land owned by other Native corporations, such as the Arctic Slope Native Corp., which has been sharing millions of dollars it has received from its Alpine oil-field leases for the last few years. That’s the beauty of Native profit-sharing, Sandvik said. “We don’t have oil, but we happen to have zinc,” she said.